Over the past several months, I have been running a series entitled “The Marcion Problem,” where I have been examining Marcion of Sinope’s influence on the development of the New Testament canon. In light of yesterday’s final post in this particular series, I felt it worthwhile to post my select bibliography from this project. As I am currently revising a version of this series for a paper, any additional resources on Marcion would be appreciated. Barton, John. Holy Writings Sacred Text: The Canon in Early Christianity. Westminster John Knox Press: Louisville, 1997. Print. Blackman, E.C. Marcion and His Influence. S.P.C.K. : London, 1948. Print. Burkett, F.C. The Exordium of Marcion’s Antithesis. Journal of Theological Studies. Vol. 30. 1929. Electronic. Dungan, David L. Constantine’s Bible: Politics and the Making of the New Testament. Fortress Press: Minneapolis, 2007. Print. Ehrman, Bart D. Lost Christianities: The Battles for Scripture and the Faiths We Never Knew. Oxford University Press: Oxford, 2003. Print. –. Lost Scriptures: Books that Did Not Make It into the New Testament. Oxford University Press: Oxford, 2003. Print. –. The Orthodox Corruption of Scripture: The Effect of Early Christological Controversies on the Text of the New Testament. Oxford University Press: New York, 1993. Print. Eusebius. The History of the Church from Christ to Constantine. Translated by G.A. Williamson. Revised and edited by Andrew Louth. Penguin Books: London, 1989. Print. Heckel, Theo K. Vom Evangelum des Markus zum viergestaltigen Evangelium. WUNT 120; Tubingen: Mohr-Siekech, 1999. Print. Hill, Charles E. “What Papias said about John (and Luke): A ‘New’ Papian Fragment,” JTS 49(1998): 582-629, esp. 616-7. Print. Hinson, E. Glenn. The Early Church: Origins to the Dawn of the Middle Ages. Abingdon Press; Nashville, 1996. Print. Hippolytus. The Ante-Nicene Fathers: Hippolytus, Cyprian, Caius, Novation, Appendix. Translated and edited by Alexander Roberts and James Donaldson. 1950. Electronic. Hoffman, R. Joseph. Marcion: On the Restitution of Christianity: An Essay on the Development of Radical Paulinist Theology in the Second Century. Edited Carl A. Raschke. American Academy of Religion Academy Series. Scholars Press: Chico, CA, 1984. Print. Hurtado, Larry W. “The New Testament in the Second Century: Text, Collections and Canon.” Transmissions and Reception: New Testament Text-Critical and Exegetical Studies. Editors J.W. Childers and D.C. Parker. “Texts and Studies, Third Series,” 4; Piscataway, NJ: Gorgian Press, 2006. 3-27. Print. Irenaeus of Lyons. Edited by Unger, Dominic. St. Ireneaus Against Heresies. Paulist Press. 1992. Kelly, J.N.D. Early Christian Doctrines, Fifth Edition. Continuum: London, 2009. Print. Knox, John. 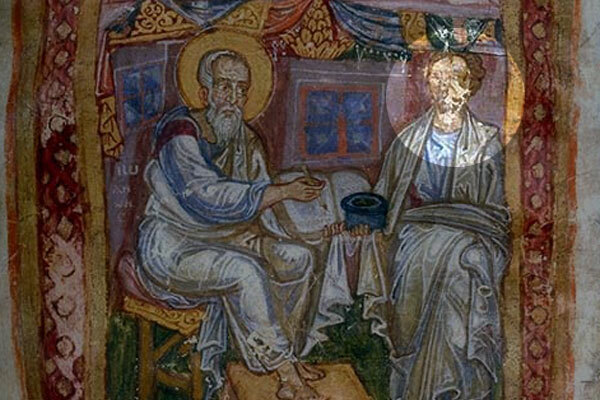 Marcion and the New Testament: An Essay in the Early History of the Canon. The University of Chicago Press: Chicago, 1942. Print. MacCulloch, Diarmaid. A History of Christianity: The First Three Thousand Years. Penguin Books: London, 2010. Print. McDonald, Lee Martin. The Biblical Canon: Its Origen, Transmission, and Authority. Hendrickson Publishers: Peabody, MA, 2007. Print. Metzger, Bruce M. The Canon of the New Testament: Its Origins, Development, and Significance. Claraendon Press: Oxford, 1997. Print. –. The New Testament: Its Origins, Background, and Content. Abingdon Press: Nashville, 1965. Print. 274. Noble, Paul R. Book Review. The Spirit and the Letter: Studies in the Biblical Canon. Journal of Theological Studies. Vol. 49. April 1998. Oxford University Press: Oxford, 1998. Electronic. Price, Robert M. The Pre-Nicene New Testament: Fifty-Four Formative Texts. Signature Books: Salt Lake City, 2006. Print. Sanders, James A. From Sacred Story to Sacred Text: Canon as Paradigm. Fortress Press: Philadelphia, 1987. Print. Tertullian. The Five Books Against Marcion. Translated by Alexander Roberts and James Donaldson. The Anti-Marcion Writings of Tertullian. Edited by Paul A. Boer, Sr. Veritas Splendor Publications: 2012. Print. 102-511. –. The Prescription Against Heresies. Translated by Alexander Roberts and James Donaldson. The Anti-Marcion Writings of Tertullian. Edited by Paul A. Boer, Sr. Veritas Splendor Publications: 2012. Print. 51-101. Trobisch, David. Die Entstehung der Paulusbriefsammlung: Studien zu den Anfangen christlicher Publizistik. NTOA 10; Gottingen: Vandenhoeck & Ruprecht, 1989. Print. Tyson, Joseph B. Marcion and Luke-Acts: A Defining Struggle. University of South Carolina Press: Columbia, 2006. Print. Von Campenhausen, Hans. The Formation of the Christian Bible. Translated by J.A. Baker. Fortress Press: Philadelphia, 1972. Print. Von Harnack, Adolf. Marcion: The Gospel of the Alien God. Translated by John E. Steely and Lyle D. Bierma. Labyrinth Press: Durham, 1990. Print. –. The Origin of the New Testament and the Most Important Consequences of the New Creation. London, 1925. Print. Wand, J.W.C. A History of the Early Church to A.D. 500. Routledge: London, 1994. Print. Wilson, Robert Smith. Marcion: A Study of a Second-Century Heretic. James Clark & Company Publishing: London, 1980. Reprint. Zahn, Theodore. Geschichte des neutestementlichen Kanons. Leipzig, 1888-1892. Print. Really enjoyed your series Jacob! Markschies, Christoph. Christian Theology and its Institutions in the Early Roman Empire. BMSEC 3. Waco, TX: Baylor University Press, 2015. Pages 217-231.